I must admit that before I got it in my hands I was skeptical. But when I received it...wow!! 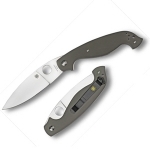 This is a beautifully built, amazingly smooth and ergonomic gem of a folding knife. It shines when performing so many daily tasks, especially food prep. I am mesmerized opening and closing this elegant knife...smoooooth! What a great tool and what a charming piece. Love it!! Great knife, the sebenza inspired liner lock reduces the thichness of the knife. It's also a great idea to copy the shape of the original african chokwe knives. I am not sure however if the pointed blade would resist hard use.